In the near future, even if the towns [devasted by the earthquake] have recovered, even if the schools are repaired, lost family and friends will not return. The children will have a lot of “homework” to get over. But without forgetting the pain of the disaster, if there is someone who can keep giving encouragement – “you are not alone” – over the long term, keep providing kindness, we believe this can be the driving force to get through this trial. And in turn, with the strength due to overcoming this trial, they can become an adult of strength and kindness, and in turn be an ally to help solve the future challenges society will face. Children who have faced hardship and adversity can become stronger and kinder than anyone. The growth of children affected by this disaster is this country’s new hope. With these thoughts in mind, we established this fund to provide on-going support to children. Read their complete mission statement. You can donate directly with a Visa or Mastercard credit card in increments of 1,000 yen; or if you're in Japan, you can make a donation via bank transfer. (I don't recommend international bank transfers since the fees are ridiculous.) Alternatively, and especially if you're in the UK/Europe, Japan Centre is holding a Tsunami Art Relief Project event on their online shop, with many attractive items for sale; proceeds go to the Hatachi Fund. 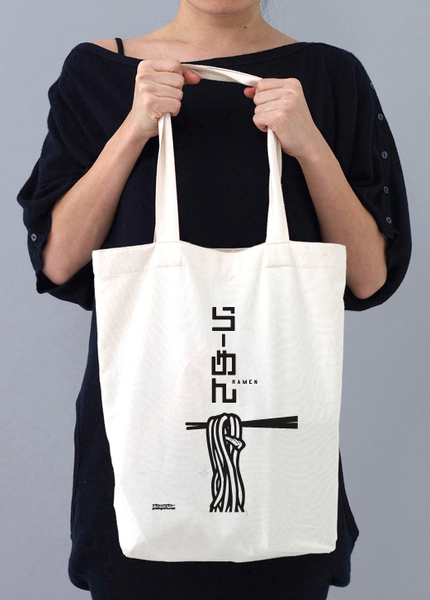 I've already ordered this pretty cool grafikgraffi ramen tote bag for myself. I've already mentioned this before, it's still one of my favorite ways to donate to the survivors of the earthquake that are most in need. This method may appeal especially if you want to donate directly to the grass-roots organizations that are helping people, and animals, who were most directly affected. Here is the list of organizations seeking donations of goods. Click on any of the links in the list. For example, this is the wish list of a facility in Ishinomaki City that houses many elderly people who are unable to work or move around much. Most of the wished-for goods are things like rice and umeboshi, which I'm sure the residents crave. Just click on the yellow-orange 'put into shopping cart' button (the wish lists are laid out exactly as they are on other Amazons). 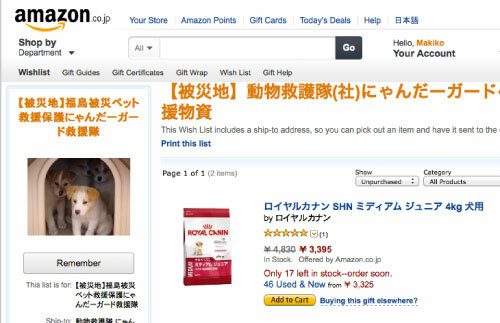 So to repeat: first go to the Amazon Japan home page. Switch the page to English, and open a new Amazon account there. They do take international credit cards. Input your info as you would on any other Amazon. Click through the list to find an organization that appeals to you. At this point the organizations seeking donated goods are either ones that run shelters or delivery goods and services to people living in temporary homes and/or the elderly and immobile, or animal shelters and animal rescue groups. You can tell which is which by the types of goods they are asking for, as well as the profile picture. All the animal related groups have adorable pet pictures. This is the page for the Fukushima animal shelter mentioned above. Their top priority item is dog food. If you think that Japan is a rich enough country to take care of itself, consider just placing a donation with an organization that goes to help out during any world crisis, such as Doctors Without Borders. I wrote about my thoughts on the one year anniversary a year ago. Submitted by maki on 2013-03-11 20:50. 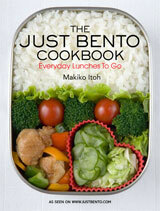 Thanks for posting, I always enjoy all that you share about cooking and about Japan and the culture. Just before I Read this I just finished watching this short move about the Tsunami, called "The Tsunami and the Cherry Blossom". It is very touching and I could feel the heartache and the hope from the people in the film. I must say that purchasing random (to this Canadian living in Germany) Japanese food entirely in Japanese is a new adventure. I just followed your link and clicked on the yellow buttons a few times. I became an embarrassed American on March 11, 2011. I live in the Kanagawa Prefecture. Days following, I spent countless hours on the computer calming the nerves of family members because of the sensationalism of the US media. At one point, one of my Japanese mothers (I teach in an American school), gave me the most beautiful card telling me how thankful she was I stayed to continue teaching her son. The out pouring of appreciation of the Japanese people during that time endeared the entire country to me - a country I had already come to love. Thank you very much for providing such resources to assist. I need some help getting Amazon pages to English, please. I've watched NHK world news for years on local PBS-TV (as well as BBC), and my admiration for so much of the Japanese culture continues to grow. There have been some amazing TV shows regarding the care of the elderly. I'm grateful for a way to help. Thank you for posting this. Although I'm not Japanese, the country and the people of Japan are very dear to my heart. It made me really sad and angry this morning when the local news 'celebrated' the anniversary of the quake by complaining about all the tsunami debris 'clogging our shores'. The media would rather focus on pieces of flotsam than the people who experienced the tragedy and those who still need our help. I can't imagine what these people are thinking when they say things like that. Thank you for letting us know how we can still help and the links. I'll be donating. If you donate to the Salvation Army and specify that it be used for Japan's tsunami relief, it will go there and nowhere else. The Salvation Army is more respected and honest than the Red Cross. Love your post here. My heart went out to everyone at that time and I had wished I could do so much more than I did. Yes sadly Japan has stereo-type like you said and I am jealous of my friend who is a Japanese teacher and gets to take her students to Japan. I want to learn more about Japan then it is just a place of ramen, sushi and anime. I try to learn everything I can and will one day read all your post. The Japanese culture fascinates me as does the landscape. I tried to donate but am confused by the webpages being in Japanese. I would really like to donate to an animal fund as well as any general relief. Any assistance would be greatly appreciated. I just came back from Japan and have never felt such amazing hospitality and respect anywhere else in the world. Thank you and love your blog! 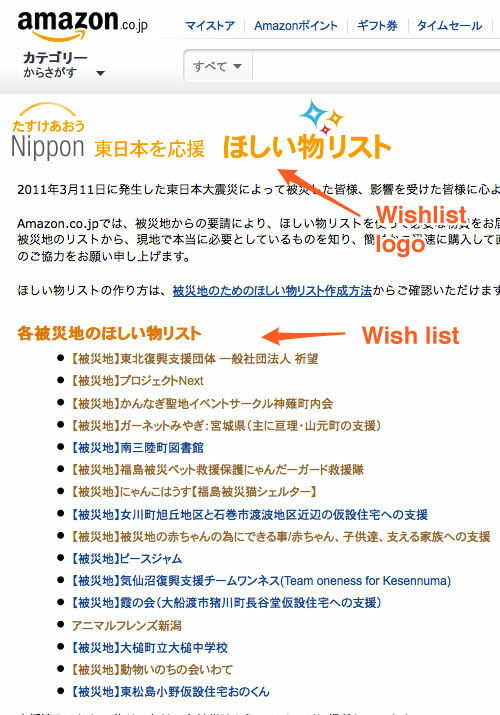 For people confused by the Amazon Japan wish list pages, I'll put up a screenshot illustrated guide soon. just tried donating via amazon.com.jp, but i could not select the Shipping address that you defined. It jumped to a page which required me to add an address ie the address of the facility for the senior citizens. Hi, as I commented above I'll put up a screenshot-guide soon for the Amazon Japan wish lists.